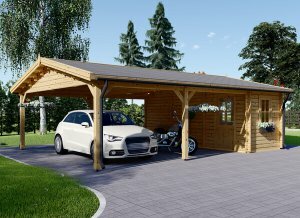 Give yourself twice the space with the 20 x 20 Classic Double wooden carport. Perfect for shielding your favorite two vehicles, or perhaps a very large one, from nature’s elements. The slowly grown conifer timber used to construct this carport gives a high level of strength and stability against wind and rain. In addition to its functionality, the Classic Double offers a natural wood look that is unique and stylish. Avoid the hassle, cost, and inconvenience of building a metal or concrete structure with the purchase of the Classic Double wooden carport. 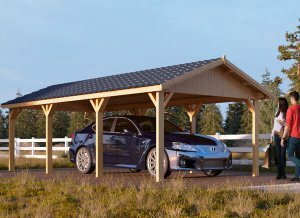 The Classic Double wooden carport comes with four posts on each side and four roof vaults delivering a high level of stability. Metal brackets hold these posts securely for added peace of mind (supplied separately). You can be assured of its strength and reliability thanks to a fabulous five-year anti-rot guarantee. Keep storms and rain away with your choice of roof covering—premium felt or upgrade to five layer shingles if you wish. External dimensions (width x depth) 19'8" x 19'8"
Internal dimensions (width x depth) 18'8" x 18'8"